Last year, I went vegetarian for a month, which resulted in quite a few creative recipes. 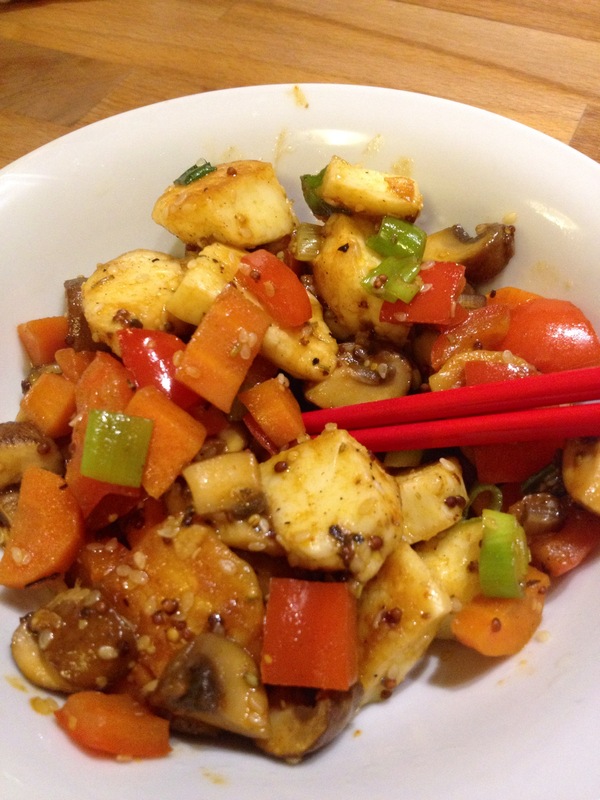 So this year, I decided to do the same, and the first new dish I made was this delicious halloumi stir-fry. I love halloumi, but normally I just fry up some slices and add it to salad. Last night, I made the pieces slightly bigger and really made it a meat substitute, and once everything was fried up, it felt like it was chicken (but… better?). I made sure the vegetable pieces were quite small in comparison, which is also nice for the aesthetic. I ate the stir-fry just on its own, but you could wrap it up in a tortilla (or lettuce, for a healthy option) with some sour cream, or even have it with rice. Don’t be put off by the list of spices. It’s nothing out of the ordinary, so you should have most of them lying around. If you don’t, no bother, just spice it to your liking! Heat a non-stick pan on high heat and add the olive oil. 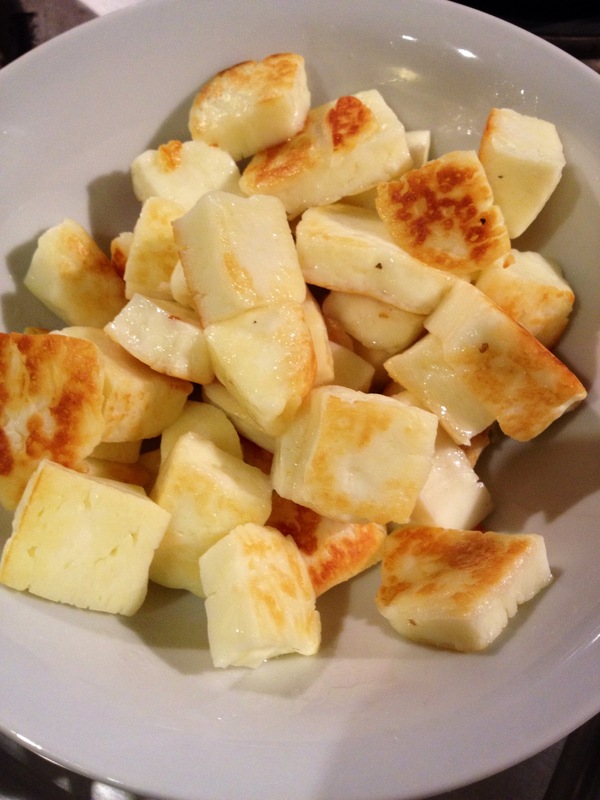 Fry the halloumi cubes on high heat until slightly golden brown, and then remove from the pan. Add the mushrooms with a dash of water and let fry for a couple of minutes before adding the red pepper and carrots. Stir-fry for a couple minutes before adding all the spices and sauces, mixing thoroughly as you go along. Let the vegetables soften slightly before adding the spring onion. Stir-fry for 2 more minutes and then add the halloumi back into the pan. Stir to coat it in the sauce and then serve immediately, either in wraps, with rice, or on its own. 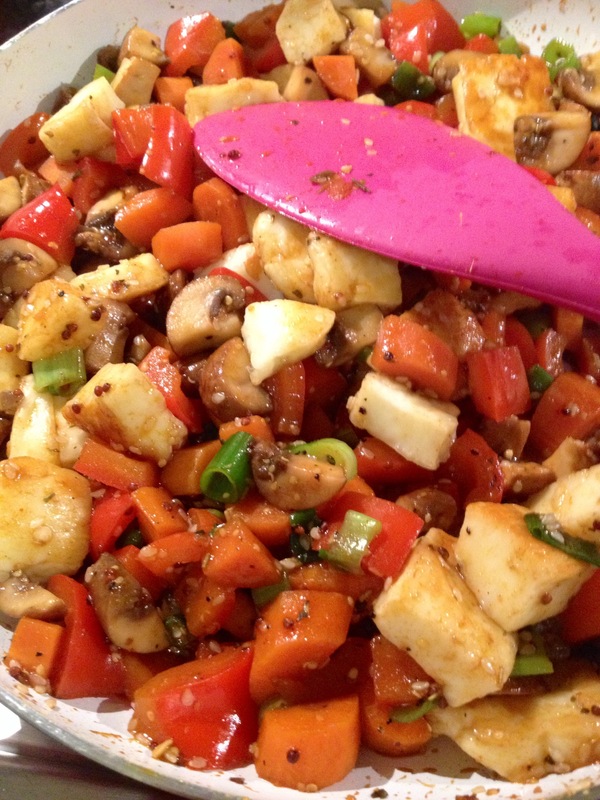 I love Halloumi- great little recipe!